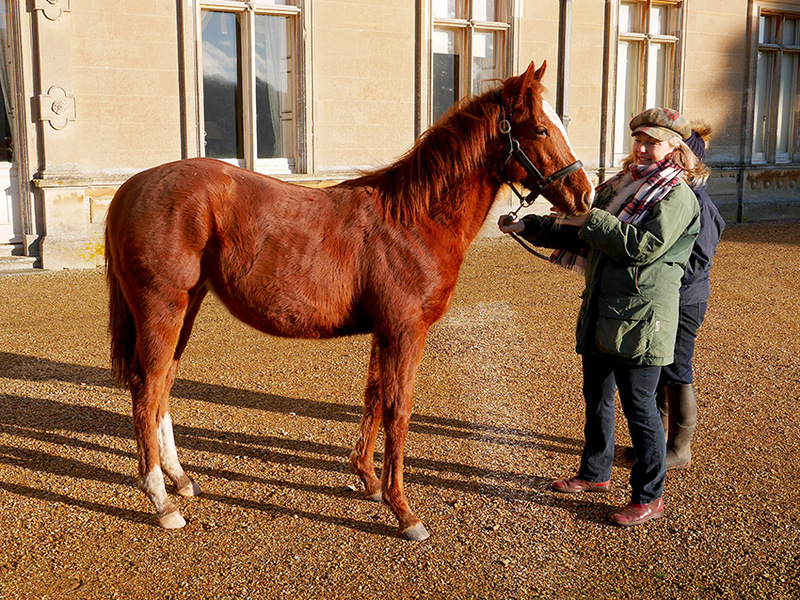 Almost exactly a year ago, two little thoroughbred foals were born at Highclere, both bright chestnut, with white markings and bright eyes. The first one was swiftly nicknamed Bonny and the second one Ginger. These, of course, are not their racing names which we are still happily debating but a favourite, at least on my part, is Bella Notte meaning beautiful night, which relates to one of the sires – Twilight Son. When the foals were born the weather was cold but not as snowy as today, nevertheless it was midwinter – near Candlemas. Candlemas is amongst the oldest feasts of the Christian church, taking place forty days after Christmas day which is February 2nd. Officially it marks the ritual presentation of the baby Jesus to God but it is also the celebration of light. It was on this day that all the Church’s candles were blessed for the following year. Today, in most countries, we take electric lights for granted yet they have only been in our homes for such a short time, perhaps 120 years at most. Maggie Smith of course, as the Dowager Lady Grantham, marked their arrival with the comment “Such a glare” shading her eyes with her fan. Geordie’s grandfather would famously declare that all the lights were to be turned off immediately after dinner to save electricity. Robert the Butler would then arrive bearing an array of torches on a silver tray in order for the guests to be able to find their way upstairs to bed. It is easy to forget the importance and value of candles and the very real difference between light and dark. In 2019, candles are a wonderful treat, throwing flickering lights, often accompanied by soothing scents, and leaving flattering shadows around rooms and faces. When extinguished, they lead to darkness and our minds and bodies know to relax and sleep. In pre-Christian times, February 2nd was the festival of light because it was the mid-point of winter, half way between the winter solstice (shortest day) and the spring equinox. Thus on Candlemas many people placed lighted candles in their windows to scare away evil spirits that may have been present on the dark winter nights. Apparently if someone brings snowdrops into the house on Candlemas day, it symbolises a parting or death. I am not exactly sure how this superstition works as Snowdrops were once called Candlemas Bells and, as a symbol of purity and light, they were brought into churches on this day. In older churchyards you will still find drifts of snowdrops planted to supply flowers for Candlemas. We have planted some here in the park and they nestle amongst the curled up brown leaves like tiny white lanterns. Despite their delicacy, they appear with fortitude during the harshest month of the year. Their thin long green leaves have specially hardened tips which help them break through the frozen earth, whilst their sap contains a form of antifreeze to prevent ice crystals forming. At this point in time, it does look like a possibly more challenging spring than we have had for a while but then I remember last year and the rains and think perhaps not. Gardening is an on-going passion of Geordie’s and mine and, luckily, Easter is much later this year. Over the last few years, as well as the “Candlemas” bulbs, we have planted tens of thousands of other spring bulbs here so that ,when we open in April, the gardens will hopefully be awash with spring colour and give much pleasure in otherwise uncertain times. I love ❤️ your blog! I dream of returning to Highclere one day! Your blog is such a pleasant start to the week. I was very struck by the poem about Candlemas, so much more elegant than folks in the US watching to see if the groundhog sees his shadow! Alas, it was bright and sunny, six more weeks of winter here. I love reading your blog! It transforms into a peaceful read after a stressful day. I so hope to one day visit Highclere Castle! Have a blessed winter and prayers for an early spring. I love Candlemas! Your description is very evocative of such a special festival in the calendar. It is very calming somehow to remember these traditions! Bonny is absolutely beautiful!! Again, thank you for all of the great pictures. I enjoy taking time to read your blogs, they are always interesting, you are a talented writer. My dream is to visit someday. Thanks for helping me picture it in the meantime. Needles to say Monday had a hectic start and I missed this lovely blog that I look forward to. Your words are so inspiring my lady, Thank You for taking the time to share these beautiful thoughts with us. I hope to come back to visit again this year, Highclere is and always will be very dear to my heart. I am so thrilled with the beauty you get to live and experience with each day. Such beautiful photos and thank you so much for sharing wonderful blog. What a lifetime joy to be able to visit Highclere one day. In 2014, our cruise offered a “Downton Day” pre-cruise excursion but we missed an opportunity to hear you speak to us at lunch. However, you so graciously allowed our group to go to Highclere as a substitute. I was so excited as it was totally unexpected. We had a lovely day and it was the highlight of the trip. I’m looking forward to the movie and planning another trip to see your lovely home! I hope you will come back soon- we have a busy summer ahead! What a nice blog. I can hardly wait to plant my flowers this year. I know your gardens are beautiful as I have seen then once. Want so much to retire again. Thanks for the pictures also. Wonderful! Love your blog. I had a great visit to Highclere, it was the highlight of my trip to England…. I am very much looking forward to my visit in May. Your blogs are such a beautiful prequel to my trip! I wonder, the snowdrops you speak of, do they have a scent? I found myself wanting so much to be able to smell that lovely photo of the snowdrops in the brown leaves! Living in Oklahoma, I have not experienced them. Have a blessed day. Snowdrops have a light, fresh floral scent which is delightful. When are you visiting in May? The gardens were lovely when I was privileged to visit them. Hope to again. Beautiful horses also. I live in Chicago, Illinois where we just experienced a Polar Vortex with sub zero temperatures reaching minus 25 F. Your blog this morning describing the sweet foals, candlemas and snow drops gave me hope that maybe just maybe spring will soon arrive. We are even more hopeful because our nationally beloved groundhog Punxsutawney Phil in Gobblers Knob Pennsylvania did not see his shadow which means an early spring. Wishing you well – you have been having a desperate time.. Beautifully written! Beautiful images of candlelight and drifts of snowdrops. Thank you. I like the idea of Candlemas better than the American tradition of Groundhog Day. Even if the groundhog does not see his shadow, most people know that Spring comes at its own pace. The snowdrops must be a wonderful and welcome sign during winter. Candlemas is a prettier name!! As a resident of Punxsutawney Pennsylvania, I would like to tell your about our famous Groundhog Day! Every year on Feb 2 people from all over the world, yes the world!, come to our little borough. This year a couple from Australia made the trek to Gobbler’s Knob to watch Phil come out of his burrow and predict an early spring. With tongue in cheek, the handlers bring him out and then his prediction is read. This year there were 30,000+ people on hand, standing outside all night long in the 10 degree weather. In our town park there are vendors of all kinds, an art exhibit and craft sale in the Community Center, chainsaw carvings, good food and just plain fun. It is a great way to break up the long winter and everyone has a good time. I talked to a couple who drove from Virginia saturday morning for the wife’s 50th birthday, it was a lifelong wish of hers since she shared the day with Phil. It may be silly and quaint, but it puts our small town on the map for one day. How many other small towns can say the same! Once again I’ve had an uplifting beginning of my week. What a beautiful yearling and great pose. Thank you so much for the explanation of the snowdrops. Bulbs have always been so miraculous for me because I leave them in the ground in this location and suddenly the flowers arrive. Since the Polar Vortex 2019 has affected so many of my friends(USA) and your recent posting about snow, my curiousity is on full alert. 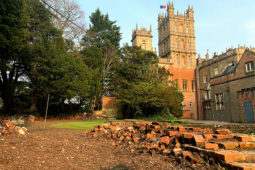 No rudeness intended- does Highclere employ a full-time plumber? The idea of prepping for winter in addition to your renovations/modifications is quite a project. The memories I have of learning skills because my parents’ belief that “you won’t know if someone is doing it properly if you don’t know how to do it” have carried me through many situations. Finally, thank you for sharing such a beautiful glimpse into Highclere and your joy with the experience of living there. Whilst we have had 19cm (about 7.5 inches) of snow here, the weather in Chicago has been absolutely Arctic – I do hope you are keeping safe and warm. 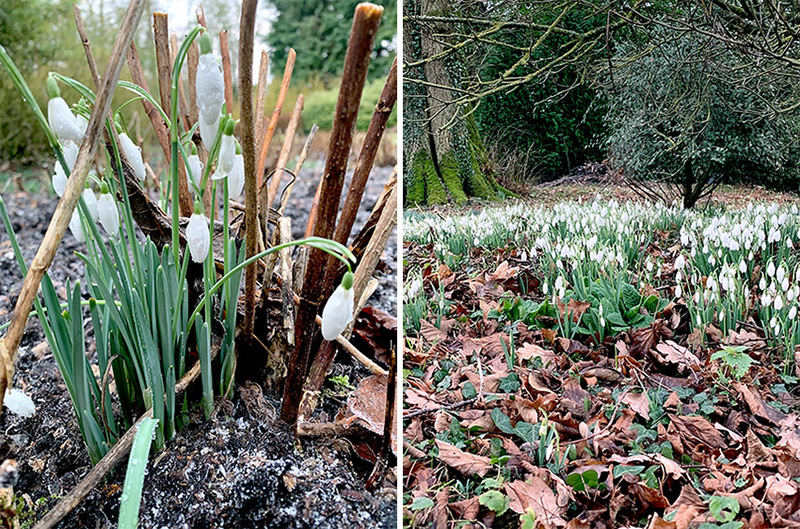 Today the snow is thawing and the snowdrops are turning their heads once again toward the sun. Let’s hope Phil is right! Thanks so much for a lovely start to the week and a reminder that the winter won’t last forever! After this last weekend, Spring cannot come soon enough for some of us. I don’t know if we have snowdrops in the USA, but we have a groundhog that just predicted an early spring. Last week was extremely cold in the east coast and I wonder if the snowdrops will bloom in such cold weather. Any how, I’m going to do my research and if we don’t have snowdrops here maybe we’ll bring bulbs next time we’re in the UK. I saw the last episode of DA again and the snow falling on the castle was such a pretty snow, although probably it wasn’t real snow. Snowdrops and other early bulbs are quite hardy and can cope with heavy frost and snow, but the weather you have been having in the US has been rather extreme. Thank you. We shall make sure we take lots of photographs once Spring is here. I just love the name Bella Notte. It is very fitting and such a beautiful meaning. We visited your home this past June and it was the highlight of our trip. I am working with some friends to return and have Highclere as a must see again!!!! Thank you for such an enjoyable day. I am so glad you enjoyed your visit and it would be wonderful to welcome you back to Highclere. Bonny foal is indeed bonny. I must check for our snowdrops amongst the Virginia leaves and snow. Thank you for the pretty reminder! Thank you. Yes, what we call torches, you call flashlights. This was beautifully written and I learned so much as well! The picture certainly showed the beauty of God’s world and a wonderful outline of Highclere. Thank you for taking time to share the wonderful aspects of your home life with others. It is appreciated. Myself and a group of family/friends are going to be visiting your amazing homestead the week before Easter. So looking forward to seeing your lovely gardens!! The Spring bulbs should be at their best at that time. I feel spring is near after reading your blog. Seeing the snowdrops gives us hope and somehow a sense of peace. Thank you for that!! The horses are so beautiful and sweet . I love reading your blog! I hope to visit Highclere sometime. Its very high on my bucket list! I was there on 23 June this last summer. We roamed your beautiful gardens until I knew I would be able to close my eyes in my american home and remember the sounds and smells of that beautiful place. I am happily storing up my frequent flier miles for a return trip. This time, I hope to bring my daughters. One is in law school, the other is an event planner at a country club. I am trying to find a string of days when we can all travel together. Thank you for being such a good steward of so much history and for sharing it with us all. Thank you, Lady Carnarvon- so grateful to read your beautiful blog each week- I especially needed it today ! I saw that you had to cancel some tours because of the snow – We are coming in August (8) and hopefully there will be nicer weather….I love the change of seasons – ours is much more subtle here in the mediterranean climate. We have paper whites in the winter and now our spring bulbs are already making an appearance. We are still having some rainstorms with lots of wind, but not freezing like the rest, and our Napa river is quite swollen. Loved your blog today- I was waiting for this one to tell you that we are coming to visit – since last time I commented you gave me the boost I needed to book the tickets! We celebrate Little Christmas here and then we take down the decorations, so I love traditions and the one regarding the “snowdrops” is so sweet! Now today I am researching some lovely place to stay before we come your way – WOO -HOO!!! I love your blog! I was born and raised in a northern suburb of New York City and now live in Plano, Tx. I have never heard of snowdrops! But now I’ll have to research them and see if it’s possible to grow them here! (Probably not. I’m sure it’s too warm. )Enjoy your week! It’s supposed to hit 78degrees here today. Freezing by Friday. Difficult for plants. As a gardener with a tiny 1/4 of an acre, I love reading about the flowers and gardens at Highclere. Cannot wait for my first visit…with two pair of shoes. One for the castle, one to muck around the grounds! And that photo by Paul Taggart is just gorgeous. Well done! I am attending the Art & Architecture lecture in May! Your blog is such a pleasant start to the week. Greetings from Fort Worth, Texas! I receive great joy and amazement seeing my seeds and bulbs give birth to beauty, making my aching back, creaky knees, and dirt in my hair all worth the effort. When my front flower gardens are in full glory, cars and dog walkers slow down and stare. I inherited my love of gardening from my mother, who passed away a couple of years ago. My husband often tells others that I can plant a broomstick and it will sprout flowers. This part of central Texas has had a mild winter, so my bulbs are almost ready to explode with beauty, giving one hope for the future. Thank you sharing the life of your home and the people there who strive to preserve its beauty and graciousness. This was such an informative post. The ritual and history of Candlemas was very interesting. Such an appropriate way to celebrate light in the mid-winter darkness. I was not familiar with snowdrops, but find them a fascinating plant. Their winter hardiness is quite remarkable. Thank you for sharing this information. It was a welcome respite for this gray and snowy time of the year! It is all about hoping …! Oh my Lady Carnarvon – I just LOVE reading your blog every Monday!! Thank you – stay warm! I enjoy your blog so much. I hope to visit one day to actually see what I’ve been reading! Have a wonderful day! Wava Schumacher New Albany In. I love all your blogs my snow bells are blooming so lovely I look. Forward to this every Feb.I have had them for years so lovely and the scent so nice. You make my day also you are a lovely writer. Wava Milner Schumacher. A lovely blog post today. Lovely grounds. Wish I could get the hang of gardening. I don’t seem to have the touch. I, of course, meant Highclere. I’d stayed in one of your cottages and walk up to the Castle every morning. Perhaps I’d get to play with the “pups” each day. Sounds like a heavenly adventure! Beautiful pictures! Espcially the one from Mr. McTaggart. If I could send you one of my back yard right now… We have six feet of snow that the wind blew againt the balcony!!! So far from me to see any flowers make it’s way through the soil!! But these little white flowers are so cute and strong indeed! Horse names for races are so long! LOL!! Good thing Bonny and Ginger have shorter nicknames. How old does a horse have to be to praticipate in a race? Are they ready and trained at 11 months? Ah nature is so wonderful, and Highclere is such an example of it’s many treasures cohabiting in a very harmonious way! Thank you for the updated picture of Bonny…I was wondering what she looked like now and how she was coming along. Such a beauty! I always learn something new in your blogs, I had never heard of Candlemas! Thanks again for taking the time to educate us! I love this – I had never heard of Candlemas and Snowdrops. What lovely flowering plants they are! You have been my teacher this morning in Louisville KY ! We love our horses here in Kentucky -thanks for sharing a new picture of your thoroughbred! It was terribly cold here last Wednesday and Thursday – that polar vortex, but by Sunday it reached 70 degrees F! Our yearlings have been wrapped up in good rugs and love their food.. Thank you Lady Carnarvon for the blog. Here in rural New Zealand we are at the height of Summer, temperatures in the 30’s, and darkest comes late in the evening 10.00pm. If you are up around 11pm and look across the feilds they are lit up like a Christmas Tree from the lights of the harvesters. My Candlemas! Magic in a different way.. I love your blog Lady Carnavon. It makes my day reading about your beautiful castle and countryside. Wish I could get over my fear of flying so I could visit Highclere. For now I enjoy your writings. Have a beautiful day. Thank you – you will have to sail across!! We are coming Aug 8 in the afternoon. I will try and book an overnight the day before so we can come to you in the morning, then see the Castle at our appointed time. Stonehedge or Oxford would be a great side trip before we head back to London! Thanks for the tips…soooooooo excited!!! Highclere is much of a day … if you were to spend two nights then you could set off past Stonehenge to Bath? I should consult you before I book our hotel – hee-hee….yes 2 nights sounds great!!! P.S. 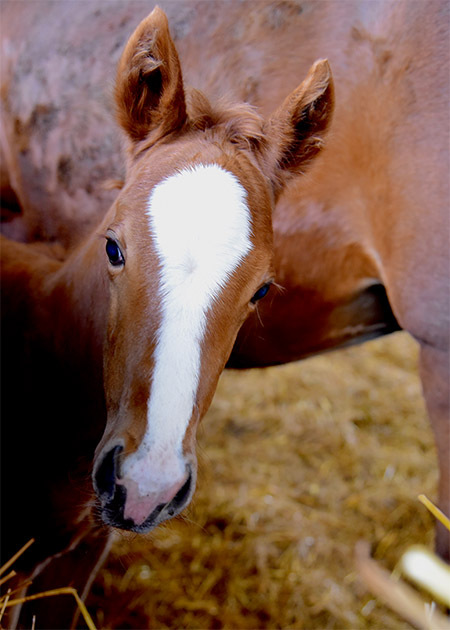 love the horsie blog today – such beautiful babies!!! I got to wondering about the belief that bringing Snowdrops into the house signifies the departing of Winter Himself? And then became associated with a death in the family later on. Aren’t we Humans a clever bunch, to see the connection of the halfway mark between Winter and Spring, and the blooming of such a lovely flower? I have the other species, Snowflakes, growing rampantly throughout my flowerbeds. I have been told that it is too hot to grow them here, but I guess they forgot to tell the Snowflakes! I am an optimistic gardener too! A wonderful piece of writing, thank you. Candlemas always makes me feel that Spring is hopefully just around the corner. The clocks go forward next month and the days are just starting to stay lighter for later. I am so grateful for lighter afternoons! In Newfoundland, Candlemas Day is used to predict the weather . No groundhogs here in PNewfoundland . We have a saying .. If Candlemas Day is fair and fine .. The worst of winter is left behind …but if by Chance to rain or snow, the worst of Winter u r yet to know . In Some small outports they have a Time ( party ) to mark the half way point of Winter. I love the name Bella Notte.Please stick with it. How truly lovely Lady Carnarvon. This is an especially beautiful post, and the lovely wintry feel to your home and estate in the photos. I too love the Belle Notte name for your “little one”. Christ truly is the “light in the darkness”. Lady Carnarvon, while all of your blogs are exceptional, this one is particularly heart-stirring. When our three daughters were little, we had an Arab mare, a pony, a goat, a million barn cats and two 90-lb. Bouviers (Schnitzel and Strudel – my mother was German). We live in the middle of nowhere and regularly provided a literal dog-and-pony-show with all of us either riding or leading our wonderful animals up and down our country lane. The Disney movie, “Lady and The Tramp,” was a favorite with our girls and the song, “Bella Notte,” (where the two dogs share a spaghetti dinner) was regularly sung over our supper table, and we do it now with our grandchildren. Finally, my husband’s 77th birthday was this last Saturday, February 2nd. As others have mentioned, Groundhog’s Day is not nearly as romantic Candlemas Day. (Also, we have a relative nicknamed Ginger …) Beautiful horses, gorgeous flowers, and an outstanding blog post! Thanks very much. Denise what coincidences ! Thank you for sharing.. The horses are absolutely beautiful. I have always wanted to learn more about horses and living on a farm with them. But never got the chance and life has just caught up with me. I love the bulbs blooming in the cold, reminds us that another glorious spring is upon us. Beautiful blog and pictures. Much love. Thank you for your comments and message – will note! “Candlemas” will be on my calendar. A candle in the window will be a warm reminder of a noble light for a good night. Thank you so much once again in allowing us to be part of your Monday. I love the beautiful stories and pictures so much. Reading your stories makes me feel like I am actually there. The horse stories remind me of where I live in Lexington Kentucky. I hope one day you might have the opportunity to race here in Lexington Kentucky with your beautiful horses at Keeneland Race Course. And Churchill Downs is only one hour away from here where the Kentucky Derby takes place in Louisville Kentucky. We even have a castle for you and your family to stay. It’s called The Kentucky Castle in Versailles Kentucky twenty minutes away from Lexington Kentucky. Queen Elizabeth has visited here on several occasions over the years, and has really enjoyed her visit. Thank you also in sharing in your traditions. The flowers are breathtaking. I have not yet visited Kentucky..
Candlemas is the official end of the Church’s Christmas season. We leave our tree up until then, enjoying the beautiful decorations all through snowy and bleak January. It is also, in the Catholic Church, the Feast of St. Blaise–and there is a blessing of throats with two blessed candles. Wonderful traditions! Thank you for sharing all with us. I will never be able to see your home in person or visit England. I became fascinated with your home and its surroundings because of Downton… by you sharing your life, I feel as if I am traveling a bit. I am glad I am able to share it through the blog.. It is hard to choose the photos!!! Your foal is an absolute beauty! Her Majesty may come knocking on your door if she sees this beauty! The color of her coat is stunning and she looks like she could grace the cover of Horse and Hound! (A bit of Nottinghill.) Your weather is quite the opposite of ours in Hawaii. It’s 80-69F and mostly sunny here. But I wish we had change of seasons to witness the appearance of nature’s change from brown bareness to beautiful spring blossoms. 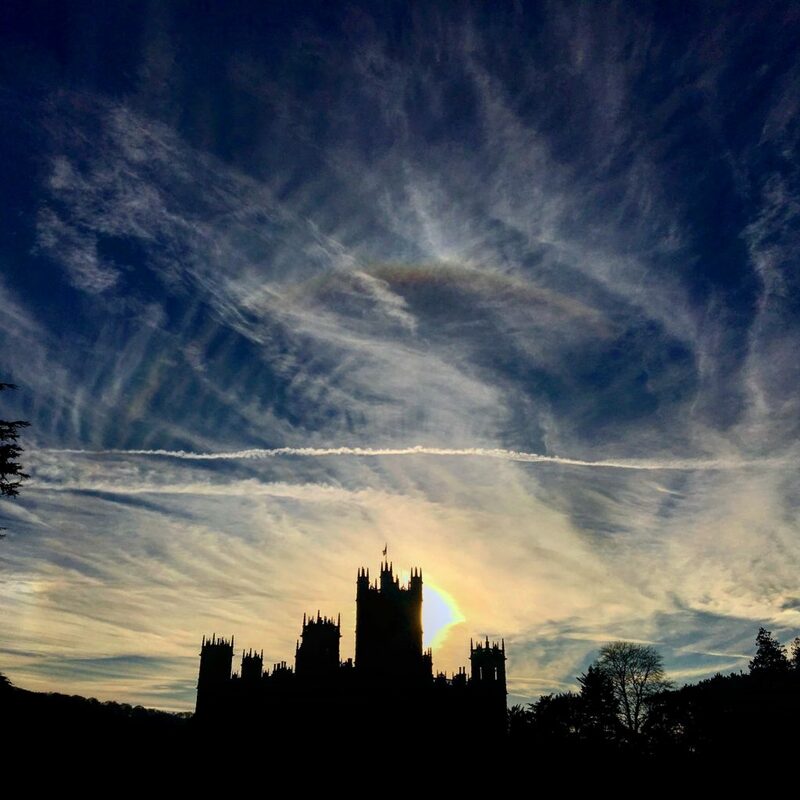 Thank you for your wonderful descriptions and photos of the grounds of Highclere. I hope to visit again one day. The snowdrops are so beautiful! And yet so delicate looking, but strong and determined. Take good care of the horse. Thank you so much for sharing. I love to read your blogs. I always learn something new. Another great blog. Love the story of the year old foals and the Candlemas. I have read you blog on this cold dark morning. I think Winter is beautiful but found your blog about Candlemas interesting and uplifting. I not only enjoy your blog, but also the sense of a global community that has developed. Where else would we learn about the almond tree tradition in Greece or read weather reports (with related horticultural musings) from such disparate places? What a beautiful celebration! I’ve never heard that over here as an American Christian. Lovely post as always. Thank you! Thank you so much for this week’s blog, and to everyone for all the discussion of traditions, flowers, light, etc. The light part brought back memories of a fascinating talk I attended years ago on what lighting was like (and how really dark dark was) before the use of whale oil, when it was candles or fires making pools of light and everything else being very dark. And this was before matches made it easy to start a light. The Dowager Duchess complained about the glare of electric light, but someone who’d grown up with just candles would have complained about the kerosene lamps the duchess was used to. No wonder so many ghost stories started in big houses with only wavering candle light to chase the shadows away! Thank you, thank you. Bonny is a beauty. welcoming snowdrops each blessed year….than daffodils….. 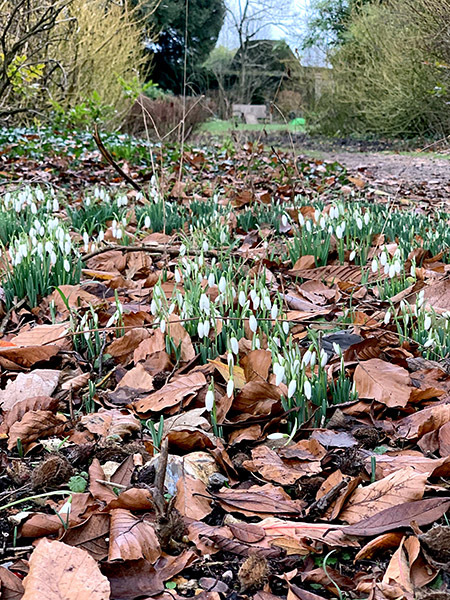 Thank you so much for including a photo of the Snowdrops. I was thinking of something completely different since I had no idea that they were a plant. 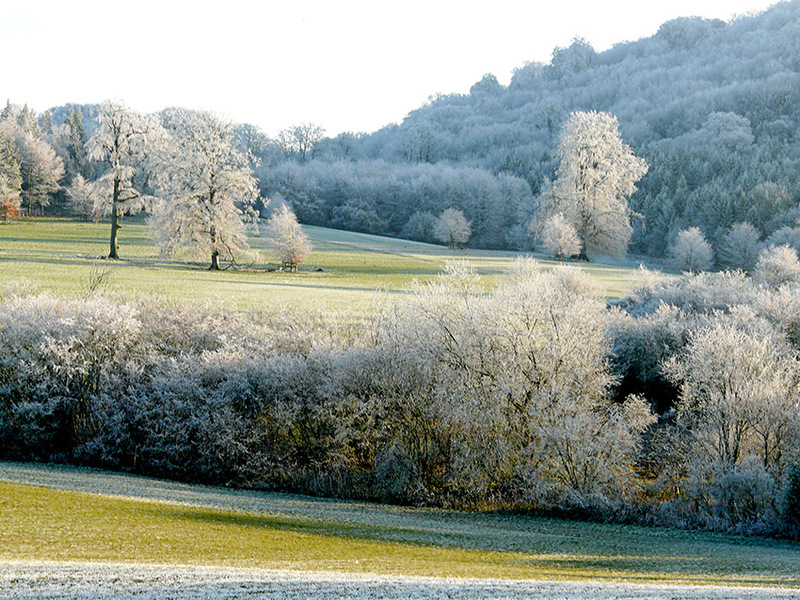 And by they way, that photo of Highclere by Paul McTaggart is breathtaking. Thank you for including that one as well. Your blogs are always so delightful and insightful. I loved reading about Candelmas and could visualize the beauty of the snowdrops as they summoned springtime. Thank you. 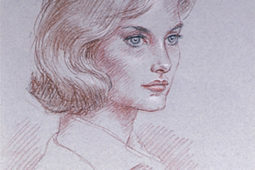 Although I’m late commenting, I read this week’s blog several times enjoying your stories and beautiful illustrations. Thank you for brightening my week! Lady Carnarvon, your blog is such a joy to read. This one was especially beautiful and inspiring. Thank you for sharing so much of yourself (I love your cooking shows), and of Highclere Castle and it’s history. I recently purchased your book on Lady Almina and the real Downton Abbey, as well as the one on Catherine, as I am preparing for a trip from my home in America to Downton this coming July 22. I am “over the moon” about this trip. Unfortunately, we secured three tickets for the Abbey, the Gardens, and the Egyptian exhibit, but failed to include the afternoon tea. That was a grave mistake on my part. I have tried without success, to buy tickets for the tea separately. If, by chance you know a way it can be done and can advise me, or even to do an exchange of tickets, I would very much appreciate it. I am 76 years old and most likely will not be coming to Downton again. I want very much to have the 3:45 afternoon tea, or tea at any hour available on July 22. Thank you. I will ask the banqueting team re the tea! Thank you very much for checking with the banqueting team regarding tickets for the tea. Bonny is very beautiful, has nice shiny hair. The story of Candlemas tradition is really lovely. I think lighting candles does purify the air sometimes. I light candles every day. It is interesting to know February 2nd, was called; The festival of light! This day is special for me for many reasons. Thank you for reminding me that, this day was the birthday of a very special uncle, who wrote beautiful poetry. I know he is shining bright. God bless. We were out of town with no internet when your blog was published on Monday. I just read it today. I’m so thankful I did! Whether I read it on Monday or Friday, it still brings me joy and information. I had never heard of Candlemas before. As other Americans have said, I find it so much more desirable than Ground Hogs Day! I also like the Christian meaning of the day. When we lived in Ohio, we had Snowdrops growing in our yard. I was always so excited to see their pretty little heads peeking up after a long cold winter. It gave us hope for Spring. The horses are just lovely. What beautiful faces. Forgive my ignorance about such things, but do you sell them as race horses? I have very little knowledge of such things. I always learn new things from your blog. 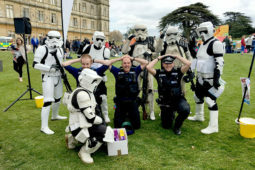 I posted some pictures on the web site from our visit in September for Heroes at Highclere. I hope you get a chance to see them. It was a wonderful time. It is difficult to decide when to vitsit. You have so many wonderful events planned. How can anyone pick just one event to attend? I’d love to go to a Tea there. It would be amazing. I was so happy to read another person mention the community who reads your blog! I agree completely. I see names that I recognise from week to week…how about an event for readers of your blog? We could get to meet each other… wouldn’t that be fun? Just a thought. I love your site. I am trying to make a blog myself to share my travels. It is not that easy. I am a fan of Downton Abby, and look forward to visiting your place, the next time I am in England. My birthday is February 2, Having just celebrated my 51st. It was good to learn a different history of the day beyond the normal groundhogs day we have here in America. I look forward to reading more from your site. Thank you – you really must come and visit.